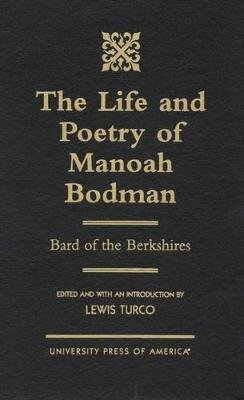 The Life and Poetry of Manoah Bodman reconstructs the poetry of Manoah Bodman, an important early American poet whose poems have not appeared in over a century and a half. Bodman, considered "a man of great eccentricity," regularly delivered orations in New England towns during the Second Great Awakening of the late nineteenth century. He published two broadsides, two booklets, and one book, all filled with depictions of verbal communication with visions of various kinds possibly brought about by epileptic seizures. Despite his long-winded, turgid prose, Bodman's poems are curiously modern in their diction. He wrote in an ejaculatory manner not seen in America until Emily Dickinson's work was published seventy-five years later, and more idiomatic than anyone else's in America until nearly the end of the nineteenth century. Bodman's inspiration was far less literary than experiential, providing a link between the work of Edward Taylor and Walt Whitman in the chain of the Transcendentalists. Lewis Turco brings together Bodman's curiously modern poems here for the first time, while providing an understanding of his life and family.